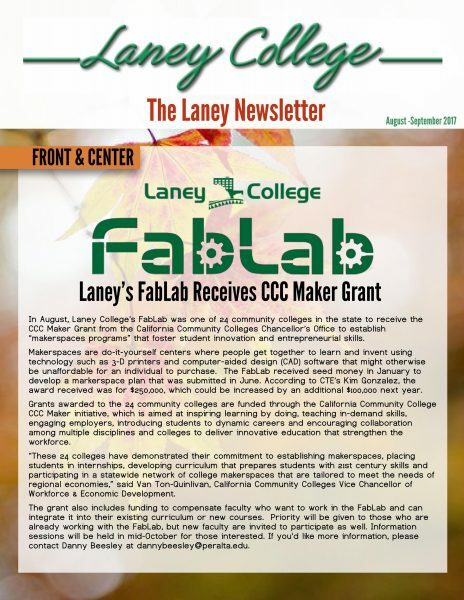 In August, Laney College’s FabLab was one of 24 community colleges in the state to receive the CCC Maker Grant from the California Community Colleges Chancellor’s Office to establish “makerspaces programs” that foster student innovation and entrepreneurial skills. Makerspaces are do-it-yourself centers where people get together to learn and invent using technology such as 3-D printers and computer-aided design (CAD) software that might otherwise be unaffordable for an individual to purchase. The FabLab received seed money in January to develop a markerspace plan that was submitted in June. According to CTE’s Kim Gonzalez, the award received was for $250,000, which could be increased by an additional $100,000 next year. Grants awarded to the 24 community colleges are funded through the California Community College CCC Maker initiative, which is aimed at inspiring learning by doing, teaching in-demand skills, engaging employers, introducing students to dynamic careers and encouraging collaboration among multiple disciplines and colleges to deliver innovative education that strengthen the workforce. “These 24 colleges have demonstrated their commitment to establishing makerspaces, placing students in internships, developing curriculum that prepares students with 21st century skills and participating in a statewide network of college makerspaces that are tailored to meet the needs of regional economies,” said Van Ton-Quinlivan, California Community Colleges Vice Chancellor of Workforce & Economic Development. The grant also includes funding to compensate faculty who want to work in the FabLab and can integrate it into their existing curriculum or new courses. Priority will be given to those who are already working with the FabLab, but new faculty are invited to participate as well. Information sessions will be held in mid-October for those interested. 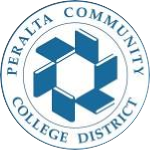 If you’d like more information, please contact Danny Beesley at dannybeesley@peralta.edu. Keith Welch was elected president of the Associated Students of Laney College (ASLC) last spring. He also completed his studies in the Culinary Arts that same semester. A native of Louisiana who moved to Oakland in 1992, Welch is currently taking classes towards an associate degree in science. He says that being in school motivates him to get up early in the morning, study, and accomplish more for himself. Though his focus is now in the social sciences, Welch’s number one love is still cooking. Last semester, he began “Green Mondays” in the campus’ cafeteria where he prepares vegetarian and vegan options for students. Welch has also been active with Laney’s food pantry which provides groceries to students in need. As president, Welch says that he’ll focus on having more activities for students on campus and also informing them about events taking place. He’s also committed to being a 9 to 5 president, someone who can be accessible to his constituents as anyone with a full-time job would. Over 20 top employers will be hiring on-the-spot at the BAYEP Career Pathway Summit – a free event that is open to student job seekers, with a focus on connecting young men of color (YMoC) ages 18 to 29 to career opportunities. The hiring summit will also feature guest speakers, community resources, give-away items, and much more! The event will be held Tuesday, Oct. 17 from 9 a.m. to 4 p.m. at the Marriott City Center. On Sept. 29, Laney will be hosting an interview and resume training to prepare students for the summit. Laney College has partnered with LeadersUp to hold the event this year. The organization is one of BAYEP’s founding organizations which helped connect over 375 young adults to career opportunities in 2016. If you’d like more information about this event, visit BAYEP.org. Joseph Koroma, also known as “Dr. J” by colleagues, joined Laney College in early 2015. Originally from Sierra Leone, Koroma left his home country in the 1990s due to a civil war that lasted 11 years. He eventually settled in the Midwest where he attended school and earned two undergraduate degrees from Manchester University and two graduate degrees from Indiana State University. During his career, Koroma has done a little bit of everything in academia – he taught geography as part-time faculty in community and four-year institutions; he’s also served as associate dean, and directed the financial aid departments of colleges in Indiana, Washington, and California. At Laney, Koroma has accomplished a lot in the financial aid department, including developing a mission statement which was reviewed and approved through the participatory governance process in the summer of 2015. He believed it was important that having a mission statement to focus on would help serve students better. In October, Koroma’s department will be hosting an open house for the campus community to stop by and check out the new tech center which was completed in June and is equipped with a smart board, laptops, desktops, and printers. Despite the great responsibilities that come with the job, Dr. J still tries to find time for his favorite leisure activities – reading, travelling, and dancing. When asked about his favorite thing about Laney, Dr. J says that it’s the diversity on campus and its location in Oakland. New full-time and part-time faculty received a warm welcome at a reception held on Sept. 4 at the Laney Bistro. The event was attended by current faculty, classified staff, and administrators and was hosted by the Office of the President and the Faculty Senate. Among new faculty at the event were ESOL faculty Rebecca Clayton and Christina Yanuaria, and English Department faculty Nima Najafi Kianfar. Present at the event were also Laney President Tammeil Gilkerson and Faculty Senate President Donald Moore who offered welcome remarks. Three students from Laney’s Graphic Arts Department will be completing important internships at the end of September. Last spring, Lauren Zimmerman, Ukari Tanaka, and Paul P. won the “Inspire Oakland” billlboard design competition and landed internships with Oakland Digital, an award-winning design studio that bridges the opportunity and digital literacy divide among students and entrepreneurs. The students’ designs placed first place in the city-wide competition and are now on display on billboards and bus stops across Oakland. The internships that followed have allowed them opportunities to present their work at Google, LinkedIn, and Facebook. The Laney Newsletter is produced by the Laney Public Information Office in the Office of the President. If you’d like to share any Laney-related highlights, please contact Dolores M. Bernal at dbernal@peralta.edu.